An angel tree topper doesn't just put the design and look of your Christmas tree together, but it also completes your Christmas decor. Whether you're on the lookout for a more traditional or classic angel topper or a modern version of it, you've come to the right place as we have listed the best angel tree toppers money can buy. For decades, angels have been the traditional tree toppers for Christmas trees. The Hazel Angel Tree Topper from Darby Home Co. is the perfect ornament for your tree if you're looking for something that's in the middle of vintage and modern. As it's gilded with a dress that's in copper and hazel colors, it makes for the best tree addition regardless of the theme or design of the tree. 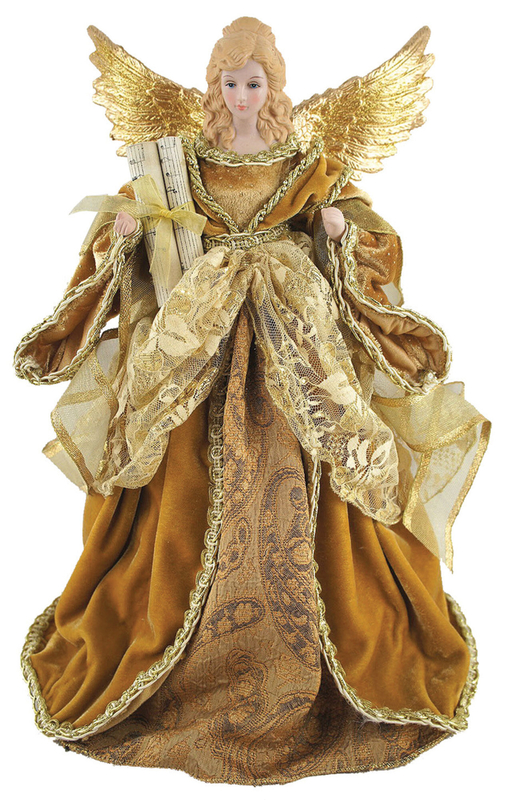 This angel has made it on our list of the best angel tree toppers as it's multi-functional. Yes, you read that right. Apart from being a tree topper, it can be an incredible vignette on your mantel or tabletop! This angel is another product from the reputable Darby Home Co. It has a more festive look with its red dress that's trimmed in faux fur for a luxurious feel. Her voluminous fabric dress isn't the only great feature of this particular angel tree topper as it also sports a bouquet of flowers in red and gold and gilded wings, which completes her look. Because the product is painted by hand with hand-crafted detailing, your guests will be greeted by a unique ornament as they enter your home! She weighs 0.9 lbs. with overall dimensions of 16'' H x 9.5'' W x 6'' D.
The Imperial Angel Tree Topper of Astoria Grand gives your Christmas tree the ultimate finishing touch. As its name suggests, it's imperial-looking with its faux fur-trimmed, intricately crafted red dress with gold accents. She also has gilded wings that lend graceful elegance to any holiday setting. The product is of high-quality and it's hand-crafted and hand-painted with holiday cheer and spirit in mind. It weighs 0.7 lbs. and it comes in just the right size, which is 16'' H x 9.5'' W x 6'' D. Make sure you have clear zip ties ready to attach the angel tree topper to your Christmas tree and ensure it stays secure and properly fastened. Inspired by a 50s greeting card, this angel tree topper can be plugged into a standard outlet to illuminate your home on Christmas Eve! This one's a bit different from the first three angel tree toppers that we've listed as it aims to add a nostalgic spirit for classic angel and star figurines into your home. Because it is constructed mostly out of metal, you can expect it to see through several Christmases without losing its appeal and detailing. Once her lights are illuminated, the pattern of her starry attire is showcased and her exquisitely sculpted, adorable face takes the center stage. Attired in beautiful red and gold tones, this 16-inch American African Diva Angel Tree Topper from Santa's Workshop adds a captivating sense of warmth into your holiday display. It features hand-painted hands and face, brown and mauve feathered wings, and an exquisitely embroidered gown with gold and red tapestry. What's made this an incredible angel tree topper isn't just her unique aura, but the construction as well. She's made primarily of wood. With her material construction and faux fur wings, she's great for homeowners who want to celebrate the holidays and use Christmas décor that doesn’t have a negative impact to the environment. Cap off your Christmas decor in style with Feather Angel Wings of The Holiday Aisle. It's a classic-style angel tree topper that's added with a cool lighting to make for an eye-catching tree addition. She has an elegant aura with her all-white dress and white fur feathered wings. As she illuminates, her fabric dress glows and takes your breath away. As her main material construction is resin/polyester, you'd be free of any worries that your tree topper might break. Use this beautiful product as your tree topper this Christmas or as one of your tabletop decorations. Do you want a designer angel tree topper to pair with your designer tree? If so, then this Kurt Adler 14" 10-Light White and Silver Angel Treetop is perfect for you! The blonde angel holds two light up candles that will help make Christmas eve feel a lot more special as you spend it with your family and friends. It's part of Kurt Adler's exclusive Tree Topper Collection. With her white and silver dress, it's an angel that is sure to enrich your holiday mantel or tabletop's look. Its base is cone-shaped so it can easily sit on top of your tree. A slightly smaller version of the previous product, this Kurt Adler 12 incher is a magnificent picture of serenity and beauty. It comes with a detailed white and silver dress with large feathered wings. Its most notable feature is its fiber optics effect that can wow your guests as you showcase your splendid Christmas decor. It comes in a small size, so it won't overpower your other Christmas decorations. Another Kurt Adler masterpiece, it's an angel tree topper with realistic fabric hair, detailed ivory gown, two light-up candles, large feathered wings, and a face that's delicately painted by a skilled artisan. As it's from the Tree Topper Collection of Kurt Adler, you can bet it's of premium quality. It measures 12.3 x 9.8 x 6 inches and weighs 14.4 ounces. The last angel tree topper on our list is nothing short of amazing. It radiates light and warmth, and it's hand-carved and hand-painted by famous artist Susan Lordi in her very own studio. As you already know, this is the angel tree topper that you can definitely show off to your guests as it features unparalleled artistry and detail. It’s a 12 incher so you can easily infuse your holiday decor with the Starlight Tree Topper's grace and majesty.